In with the new, out with the old. I got my new MacBook Pro 13″ around noon today, but had to wait until noon to start playing around on it. 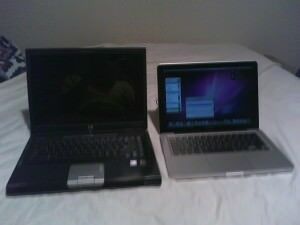 Here are my phones blurring pictures of the old HP dv4000 (left) and the new MacBook Pro (right). Notice the HP isn’t running. Thats because it no longer even boots thanks to some internal hardware problems. 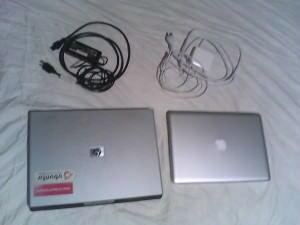 This time around I decided that I wanted a smaller, more portable laptop. 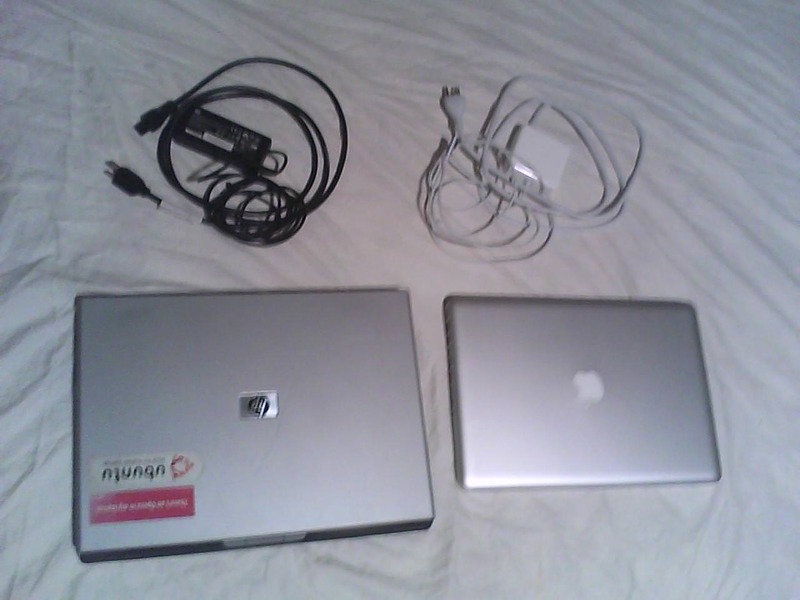 Since I’ve had plenty of Windows computers and have been running Ubuntu Linux for a few years, I decided it was about time for me to get a Mac. So far I’ve gotten the basics installed and setup thanks to suggestions from my brother and friends. I’m still testing out Xcode to see how I like it, but my first impression of the 3gb download wasn’t too positive. If it works well then great, but I was hoping to find a good medium between size and features. Have some suggested apps or tips for me, or something better than what I’ve listed above? I’d love to hear what you like to install on your Mac! 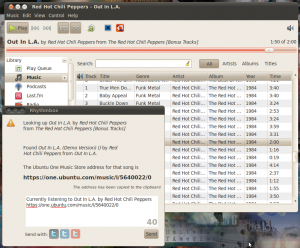 Ubuntu One Music Store..Get a Link! 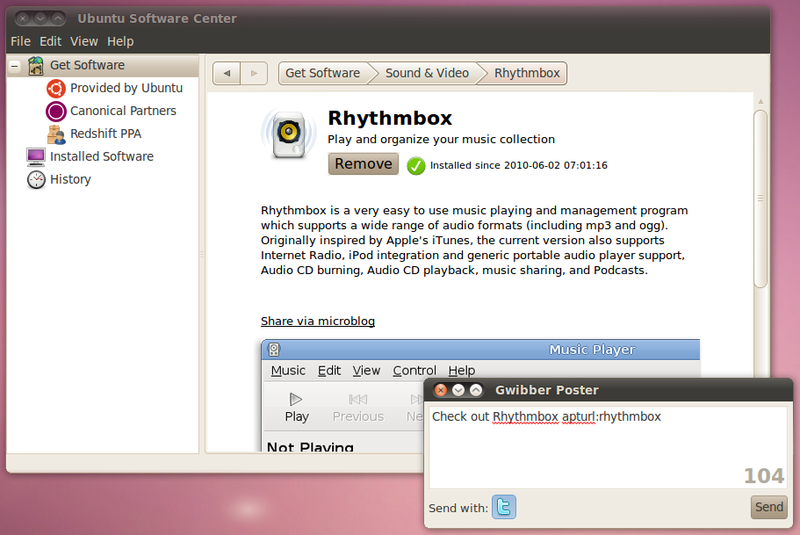 I just saw this change marked in my updates recently for Rhythmbox in Ubuntu 10.10 and thought I would share whats new so far! The new "Get a link" button in action. 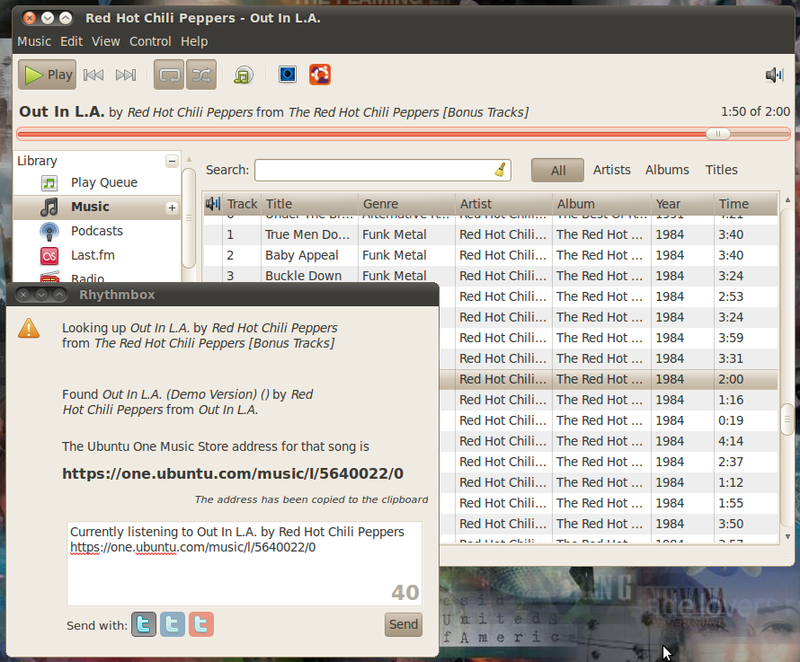 The new “Get a link for the current song to the Ubuntu One Music Store” button is now present and functional in Rhythmbox for Ubuntu 10.10. When you click on the “Get a link” button, you are prompted with a dialog that scans the online music store for a match and displays the result for you. 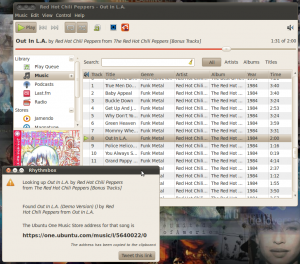 The address to the song or album is automatically copied into the clipboard and is ready to paste! Here's you link and you're ready to paste! This feature can be used to send a link of a favorite song to your friends, where they can purchase the track right away if they choose to. If you want to go even one step further, you can even tweet the link to your friends and followers! Tweet your current song to your friends and followers! As you can see, this new Tweet feature is built upon the tightly integrated Gwibber application. Though I haven’t tried this yet, it should be possible to post to other services such as Facebook if you have them enabled in Gwibber. 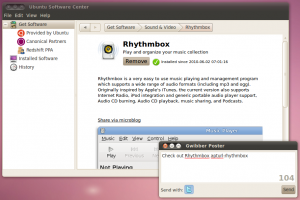 It appears that the whole “Social from the start” idea that was first started with Ubuntu 10.04 is now moving to another level and becoming commonly integrated with deeper parts of the operating system. Tweet software from Ubuntu Software Center. 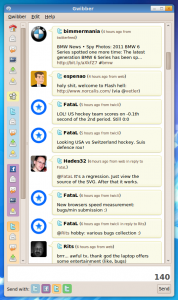 Above is an example of Twitter integration in the Ubuntu Software Center that allows you to easily suggest software to your friends. 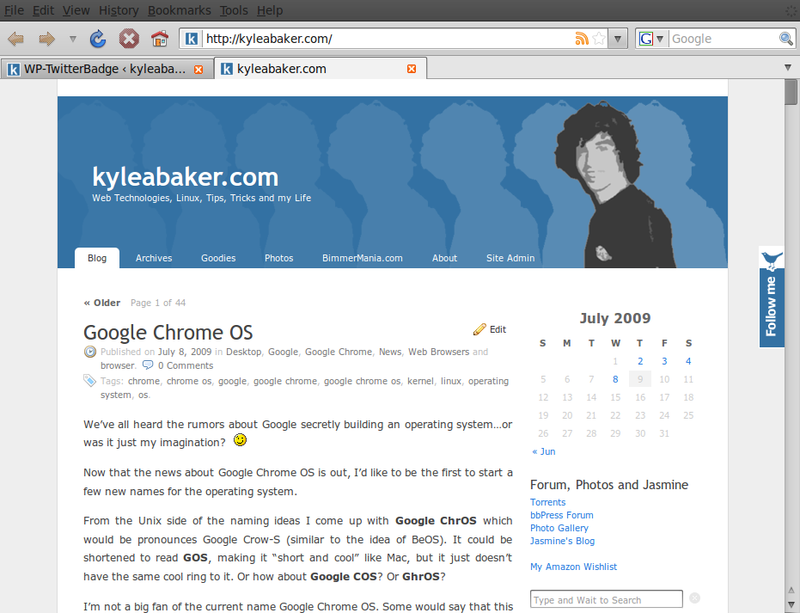 Author kyleabakerPosted on July 22, 2010 Categories Applications, Entertainment, Linux, Multimedia, Open Source, Operating Systems, Picture, Product Review, Twitter, UbuntuTags gwibber, rhythmbox, Twitter, Ubuntu, ubuntu 10.10, ubuntu software center1 Comment on Ubuntu One Music Store..Get a Link! 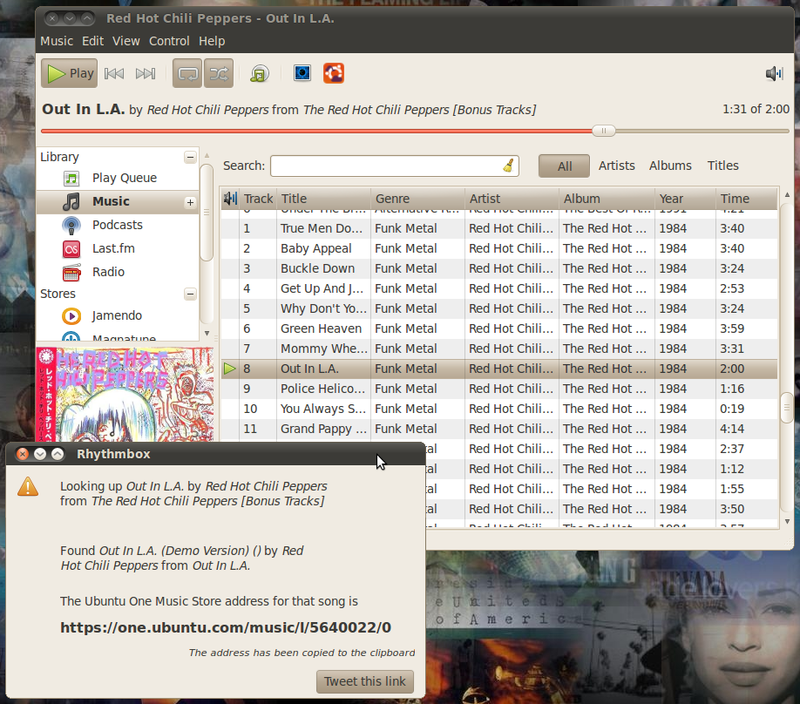 I just came across this in Ubuntu 10.10 while browsing the Software Center. I’m not sure how long this little feature has been available, but it sure does make promoting your favorite applications a breeze for Ubuntu users! Clicking the linked text, as you can see, brings up a box to post to your “Broadcast” accounts (as Ubuntu calls them, otherwise known as your social networks). Here is an example of what it posts. You’re free to edit the message how you see fit, with the important part being the “apturl:rhythmbox” token. For the record, there appears to be a bug at the moment that resets your edited message back to the default, but this will most likely be fixed. I’m a little confused as to how this will work, since Firefox supports apt:application by default and not apturl:application. Also, Firefox requires the text to be a hyperlink, like the following examples apt:application and/or apturl:application. If you find your browser unable to handle such links, you can find information here that should help you get them working. 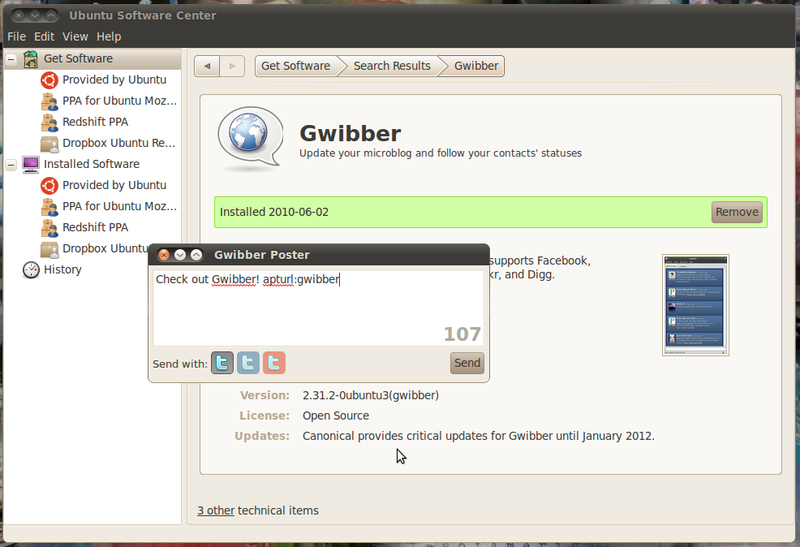 I’ve been using Gwibber on and off for a while now, but recently I’ve started using Ubuntu 10.04 full time and Gwibber has now been directly integrated. 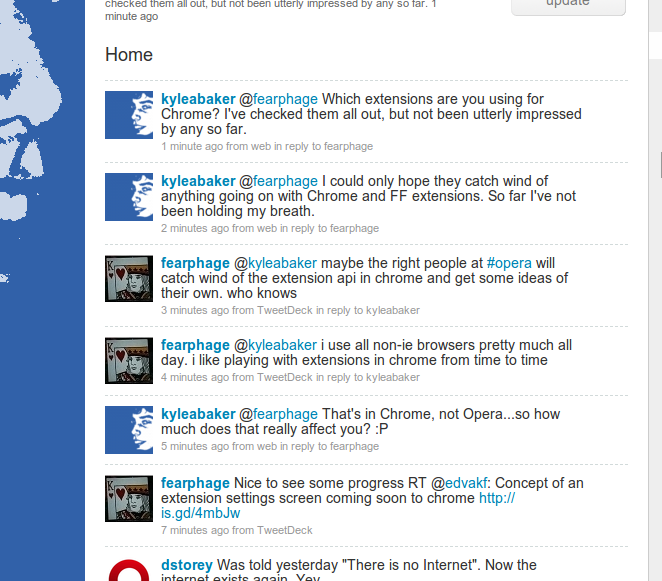 Back when I used Gwibber before, it was a half-developed Twitter client. Its much more than that now and its progressing nicely! Some people might compare it to TweetDeck for Windows, but it has a little ways to go before its as feature complete as TweetDeck. Now that I’ve submitted a (very) simple python script that enables a new url service in Gwibber, I’ve marked a point where I’ve actively began contributing to the open source community (to applications that are not my own). If you’re curious about the theme I’m using, it’s the Homosapien Metacity theme. I used the online Homosapien Metacity Customizer to get the blue theme though. You can make your own remix of this theme there if you wish or you can just download the exact one that I’m using. Now that news has spread about a potential “Twitter-Killer” coming from Google as early as 10:00am tomorrow (according to trending topics on Twitter), its time for my own dish of speculation. Around a week ago, I read a blog post mentioning that Google’s Gmail has restricted the use of the label “Buzz”. Reading this, I immediately attempted to create a label named “Buzz”in my own Gmail account and the rumor was confirmed. Playing off of this small find, I wonder if Google will release a product named “Google Buzz” that integrates into Gmail so you can follow “Twitter-like” updates by simply clicking on the Buzz label. What do you think this new Google product will be? Any speculation? We’ve all got until 10am Feb. 9, 2010 to guess! It looks like my speculations were correct. TechCrunch has a short write up regarding Google Buzz. If you want to start using Google Buzz right away and its not integrated into your Gmail account yet (it should appear between the Inbox and Starred tabs once its been integrated, but it will take some time for most people to receive the update) you can use it on your mobile (iPhone/iPod Touch/Android device) by opening your browser and navigating to “buzz.google.com“. That’s it! Hope your busy buzzing! …so, all I did was write a script that will insert a link to a style sheet that’s stored here at kyleabaker.com which overwrites these empty styles with the correct ones. 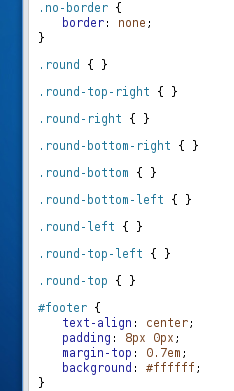 Lastly, save the “Twitter-Rounded” script to your UserJS folder that you setup in the steps above. 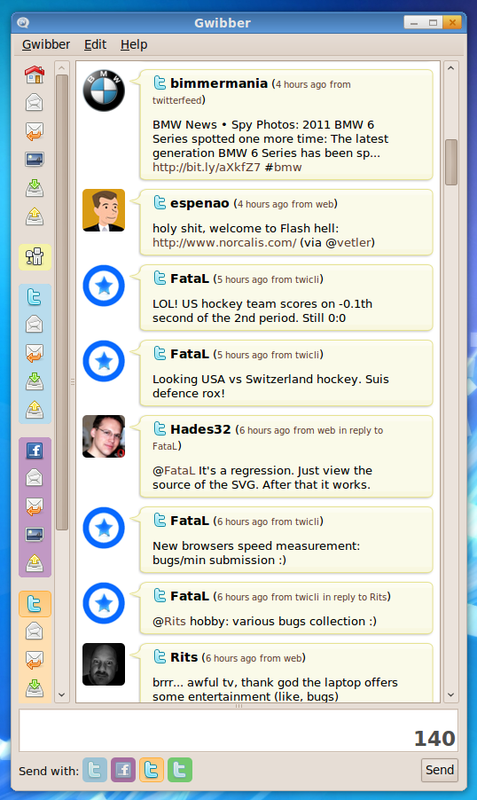 I’ve noticed lately that when I chat with friends on Twitter it’s very fast! If I ever have a quick question, I seem to be able to find an answer faster on Twitter than I can call up or email a friend to find out the same information. Maybe Twitter will come out with webcam support soon, haha. New WordPress Twitter Badge Plugin! After a quick look at the source code of the page, I had decided to build a quick plugin for WordPress to insert the same code. So the plugin process began. I didn’t want to hard code it into the footer of my K2 theme, because I frequently update to the latest K2 theme nightly builds. This way would save me a lot of trouble and even make this neat little Twitter Badge available to thousands. 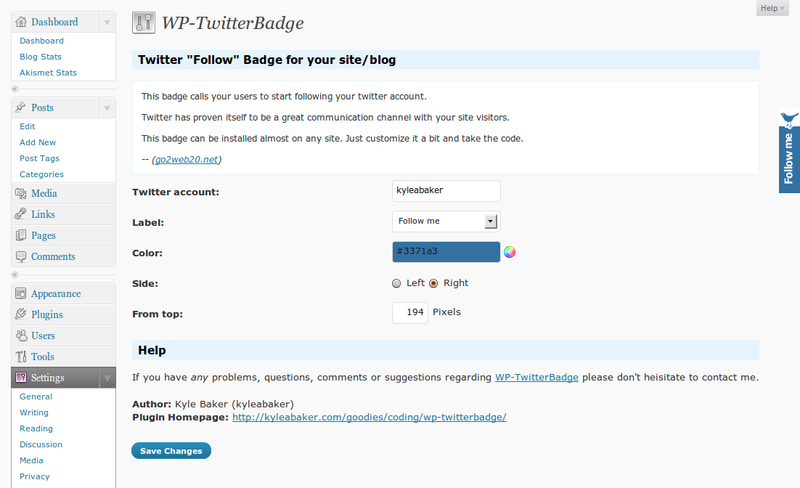 And so…WP-TwitterBadge was born. I traced the code back to an embeded script from go2web20.net and realized how n00b friendly this script would have been to install anyway even without an easier plugin to install it for you, but the fact that it would save me time in the future was well worth it. Basically, if you’re not using the WordPress plugin, you just link the script and set a few variables. This made it very easy to make it customizable as well! Just mimicking their own setup page, I was able to make a quick Options page featuring a live preview (as all of my plugins have so far 😉 ). I even coded the preview with way less script than they used on their own page since extreme error checking is really not needed (everything is live so you can see the problems there). At a rate of 20-30+ new downloads per hour I would say that this plugin is by far my most favored project…considering that it hasn’t been reviewed yet (no trackbacks thus far) by anyone whereas others already have. If you’d like to checkout this little Twitter Badge on your own site, just head over to the plugin page or search for “WP-TwitterBadge” from your “Add New Plugins” page in WordPress and install it from there. If you like it, pass it on! 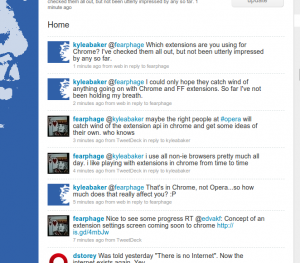 If you’re into Twitter and other forms of micro-blogging then you might enjoy this short clip. I just came across this funny image on Twitter from a friend of mine and I had to post the image here as well. 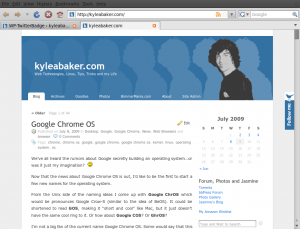 In other news, kyleabaker.com saw a burst of activity today due to the interest in my post “Ubuntu Intrepid Ibex 8.10 RC” and many Linux fans or curious people searching for Ubuntu 8.10 RC news. I ended the 24 hour period with a total of 831 hits, beating out the previous daily record of 519 that came about after posting to a Digg article regarding Opera 9.5. That last one give the final count and a preview to the searches that brought up kyleabaker.com most often. I’m glad to see so much interest in Ubuntu these days!